What is a Loopback plug? Home /Tutorials, Tech, Other Tutorials/What is a Loopback plug? A loopback plug allows us to test if the Ethernet transmission and reception electronics are working correctly, with it we can easily locate damaged ports in network cards or in a switch. In addition, this tool is necessary for laboratory or test environments, in which we need our Ethernet network adapter to detect connection to the cable and if is active or not, despite not having a real LAN. If you want to learn more about it, keep reading. In communications, the basis of a test loop is simple, it consists of connecting the output or transmission gate (TD) with the input or reception (RD) gate of the same device, so that the signal that is transmitted by TD is receives by RD without going through a communications infrastructure, so it is possible to test the communications electronics of a device regardless of the infrastructure. 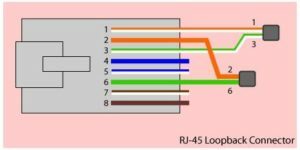 In certain cases where there are out-of-band control signals, that is, they are transported by separate circuits to the data circuit, as in the case of RS232, it may be necessary to create additional loops on the control gates, for example, for Support hardware flow control. A loopback plug or connector in addition to testing electronics allows us to “trick” and make it see that our device is connected to the cable, so we can work in laboratory environments and communications applications that need to have an active connection and be connected to the physical interface, even if we do not have a real network. In Ethernet to create a loop we must connect the output or transmission gate (TX) with the input or reception (RX) door of the same device, so that the signal transmitted by TX is received directly by RX without going through a communications infrastructure. In the case of Ethernet 10BaseT and Fast-Ethernet 100BaseT only two data communication circuits are used, Pins 1 and 2 for Transmission (TX + and TX-) and Pins 3 and 6 for Reception (RX + and RX-). Then to create a loop we will connect [pin 1 TX +] -> [pin 3 RX +] and [pin 2 TX-] -> [pin 6 RX-] leaving the other pins free, (according to the norm EIA / TIA 568A and 568B the pins 4,5,7 and 8 are reserved). In connection wiring, special attention must be paid when connecting, since Ethernet electronics do not have short-circuit protection or reversal of polarity, which could damage the wiring. In practice, if we have an RJ45 connector, we can manufacture the ethernet loopback plug quickly, for this we must take the precaution of electrically connecting the appropriate pins as previously mentioned. Keep in mind that an error could damage the electronics so I recommend that you first correctly locate pin 1 of the RJ45 connector and then check several times that it is properly connected.